ORIGIN. By Dan Brown. Random House Audio. Read by Paul Michael. 18 hours; 15 CDs. $50. 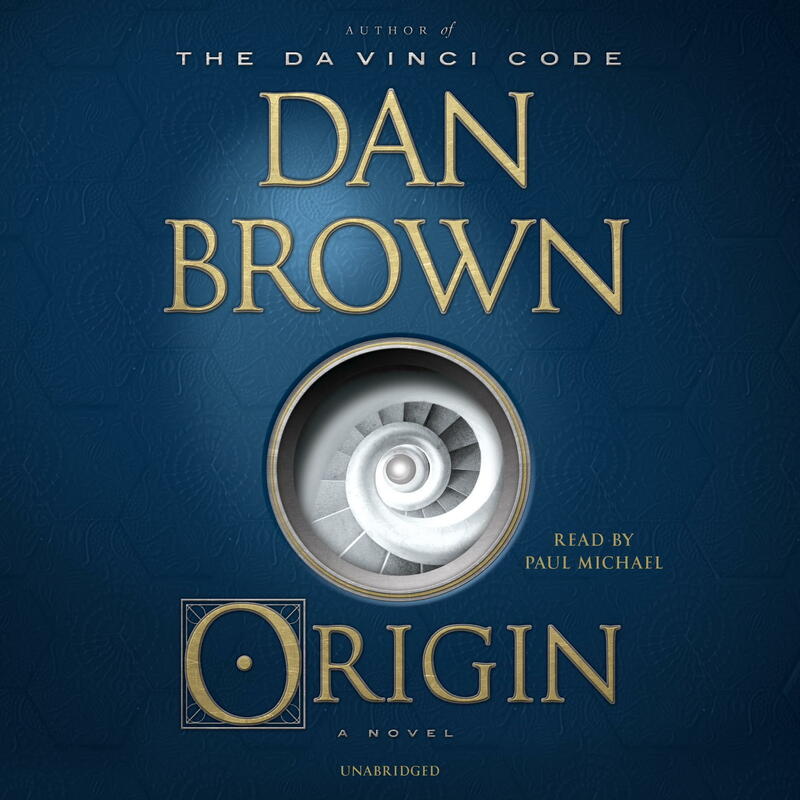 Robert Langdon, intrepid Harvard professor of symbology and religious iconology, is at it again, with all the expected mystery, codes, drama, action, danger, beautiful women, evil villains, cosmic ideas and earth-shattering revelations. My audio version of “Origin” arrived just as I was about to embark on a solo road trip, and it well served the purpose of entertaining me as I drove. I must admit, though, that this latest Dan Brown adventure also annoyed me at times. The premise is that Edmond Kirsch, a billionaire, futurist and tech wizard who was one of Langdon’s early students at Harvard, is about to announce a major discovery that he is sure will change science and the world forever. To that end, Kirsch has arranged a gathering of several hundred people, including Langdon, at the Guggenheim Museum in Bilbao, Spain, for a presentation that also will be broadcast to millions of viewers around the world who are waiting with bated breath. Kirsch, a well-known atheist, suggests to his good friend Langdon ahead of time that he’s found the answers to humankind’s most fundamental questions: where did we come from, and where are we going? But before Kirsch can get to the heart of his dramatic presentation, the gathering is disrupted in an unthinkable way. When Langdon recovers from his shock, he realizes that Edmond’s revelations may be lost forever – unless he and Ambra Vidal, the beautiful director of the museum who had helped Edmond set up the event, take drastic measures. And Ambra Vidal just happens to be the future queen of Spain, engaged to the heir apparent, whose father, the king is near death. The rest of the book takes place mostly over the course of one long night, as Langdon, still wearing the white tie and tails he’d donned for the gala presentation, and the future queen, in her dress and heels, dash around Spain in quest of Edmond’s secrets, pursued by people who are determined to stop them. Meanwhile, there’s the mystery of who stopped the presentation and why, and whether someone in the royal palace is involved. Oh, and Langdon and Ambra are guided by the most super of super computers, an A.I. assistant Kirsch created and set on a mission. As you’d expect in a Dan Brown novel, “Origin” deals with some big questions, among them the conflict between science and religion. One of my frustrations is that, with a few notable exceptions, Brown depicts people as completely accepting either creationism or science, as believing that everything in the Bible must be taken literally or rejected outright. In reality, of course, many, many people already believe what “Origin” eventually suggests, that it’s possible to accept what science teaches us and also believe that a creator set a grand design into motion – and gave us the ability to understand the mysteries of science as well as the humanity to handle them wisely. That serious oversimplification leads to perhaps my major frustration with the book: I found it hard to believe that Kirsch’s great “discovery” would have the profound effect the book suggests, or that people would go to extraordinary lengths to keep it quiet. It’s also quite a stretch to believe the way Langdon and Ambra go tearing across Spain and into dangerous situations at many of the country’s most interesting tourist sites, barely hindered by their evening clothes, lack of sleep or various attacks and injuries – but all that comes with the territory in a Dan Brown tale. Then there’s the clunky, cliché-filled and often overwritten narrative, sadly in need of an editor – but we don’t read Dan Brown books for the polished prose. Despite the frustrations, I did keep listening and enjoyed the book on many levels. Brown takes us to some fascinating locations and incorporates intriguing history and cultural information. He incorporates a clever literary code – the password to Edmond’s revelation – that must be solved if Langdon and Ambra are to deliver Edmond’s discovery to the world. And the mystery of who’s really the villain, and you’ve got a lively, entertaining story. And in the end, there’s a cautionary tale worth pondering. 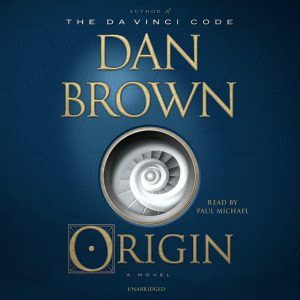 This entry was posted in Action/adventure, Audio Books, Popular fiction, Thriller/Suspense and tagged Audio Books, Dan Brown, Origin, Robert Langdon. Bookmark the permalink.